The team of German researchers has found out something truly amazing. They are intellectuals and genius in the real sense. 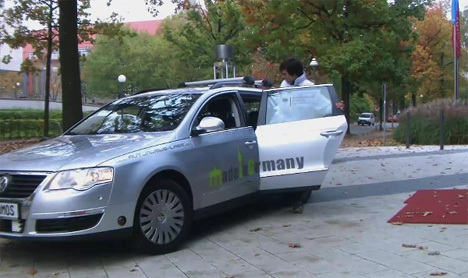 At Berlin’s Free University they have found out as to how to reveal and unveil a taxi which does not have driver.Can you believe just with the use of an iPad one will be able to eliminate the use of a car driver and this can happen if you are using Autonomous MIG Volkswagen Passat cab with iPad app Yes, this is true and in no sense this is a false thing. Can you believe this amazing MIG thing is fully loaded with GPS navigation, video cameras, Sensors, scanners made of lasers etc? With this sensor it sees as to what vehicles are moving in the surrounding area and it will also give notice of the people walking on roads and streets. It navigates a mind map and with this it shows as to what is there in the surrounding area. In order to supply information to MIG iPad transmits the information on the GPS location and indicates the instructions to taxi about the road way that has to be taken and the route that is required to be followed. The vehicle is also indicated about the final destination. There are so many advantages that this novel and revolutionary technology has to offer. If you go in the driver less fully technologically handled car then you don’t have to indicate the driver every now and then about the route. Also, you don’t have to bear the wired radio sounds. It also eliminates the need for you to discuss things with driver in regards to the fare. This is a perfect thing for those who need privacy or have to take up some private talks and do not want the driver to listen the same thing. There are so many people who are truly amazed with this new technology. They know as to how this is going to benefit everyone. If you have a cab company then over a longer period of time you will be at lower costs. This will help you in dealing with the high over head costs that your company has to bear. If you wish to have a cab with driver’s elimination then really, there is nothing like this. It will help you to take the car where you actually want to take it without any sort of headache. With the advent of new technological discoveries there will be consumers who will be benefitted completely and no one else. This is just the beginning. Ipad apps are believed to do even better and bring more and more advanced technological things on this earth. Really, the globe is in the complete benefit of iPad apps and truly having on will be an asset when thought of in the long run. Can you believe this amazing MIG thing is fully loaded with GPS navigation, video cameras, Sensors, scanners made of lasers etc? With this sensor it sees as to what vehicles are moving in the surrounding area and it will also give notice of the people walking on roads and streets. Thus there is actually driver made out of laser sensor.